accommodate 50 or so. But to have an event whose hopeful attendance begins at 200+ is a horse of a different color. And based on some conversations we’re having, we may see attendance of 1500!!! My wife has had great success chairing my kids’ school auction for the past few years. One of her primary duties was finding the space, and so it was to her we turned to do our initial scouting. After many phone calls and an organized spreadsheet, Brian and I had about 15 different venues to visit. Of those 15, we were able to narrow it down to 5 that seemed like true prospects. And so we set aside a day to go around town and visit with the various locations. Location #1: Starting price was $7,000! Yes you read that right. As Brian and I are cash-flowing this out of our own pockets—no loans, no credit cards, just good ol’ American greenbacks—they quickly eliminated themselves. have that many people to feed, I could not imagine having a need for that much food. And so another one bites the dust. 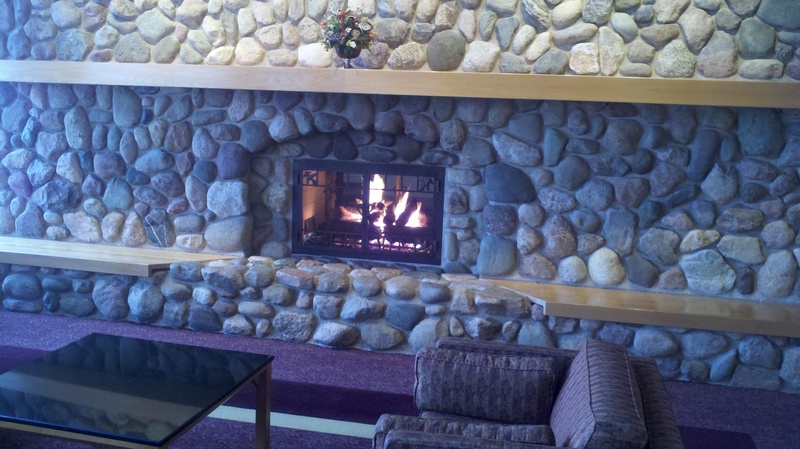 Conference Center, located on the Calvin College Campus. 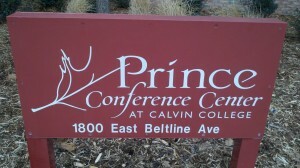 Welcome to the Prince Conference Center! The Great Hall will be divided into 2 areas. 2/3 will be for our Dealer Room, for both retailers and artists. The remaining 1/3 will be in use for our MTG Mox tournament and draft play. The frontroom is called the Fireside Room because its atmosphere is dominated by two flanking floor-to-ceiling fireplaces at either end. We can’t imagine a better room in which to place our 9 tables of RPGs. 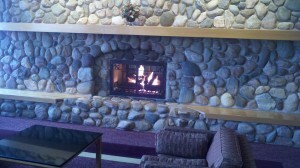 A roaring fire to set the mood for some role playing. with great joy that I can say that our new convention will be home to the same game library that visits Gen Con, with over 1000 games. 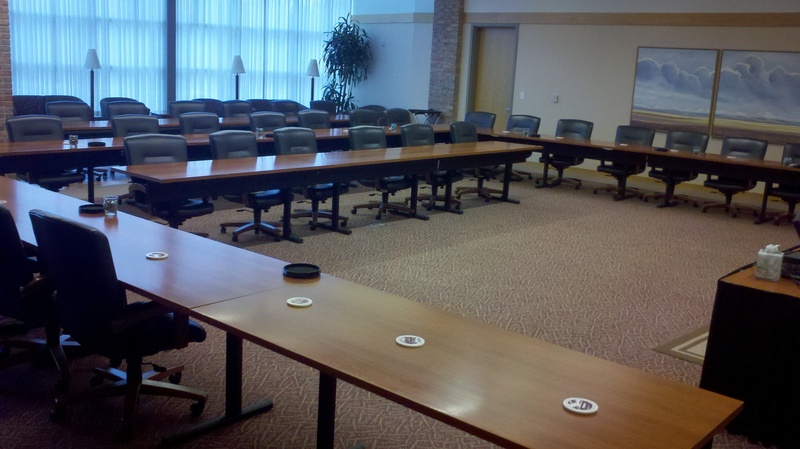 And the final room, the Boardroom, will be home to our seminars, movies, and LARPers. This state-of-the-art room will host films, seminars, and LARPs. The Prince is also attached to a 69-room hotel, and we have negotiated a reduced room rate for our convention attendees. When you come down from your room you are greeted by a complimentary breakfast, and the convention is no more than 30 feet away. 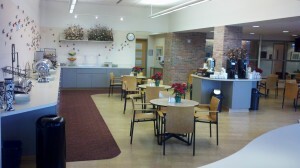 Coffee, water, cookies, and other snacks will be available to our attendees all day long, free of charge. 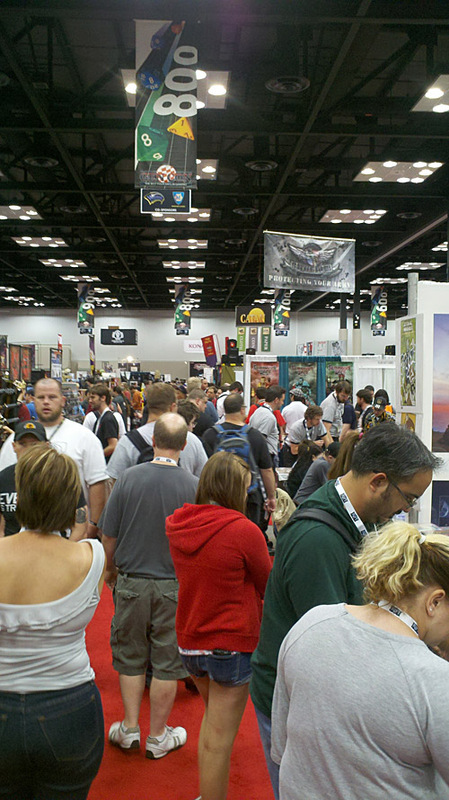 We have worked hard to give our convention the feel of a mini-Origins or –Gen Con, and the details, big and small, are coming together to make it happen. The Prince Conference Center is an amazing place to hold our inaugural event, and we can’t thank them enough for their service. We’ll see you there! I know, I know, I know… I have no excuses. Well, actually I have plenty of excuses—work, family, other hobbies/interests. I had every intention of getting this blog out at least once a month. Boy has that proved to be tougher than I thought. My hat is off to those who do this regularly. At the end of my last entry I committed to telling you all about U-Con and Fanfare. But before I delve into the experience itself, I want to give a thank you to the staff that put together both events. Not only were they both excellent shows for their fans, but we had great interactions with the people running both conventions, and their support for GrandCon, their willingness to answer questions, and their offer of future advice and assistance is just heartwarming. It is a great industry to be part of. U-Con was a ton of fun. One of my highlights of any convention for me is teaching games. The Grand Gaming Academy was there teaching Clever Mojo’s Sunrise City, Stronghold’s Milestones, Thornhenge’s Lyssan, and quite a few others. There were a good number of vendors, between 5 and 10 by my memory, and we were able to have conversations with all of them to tell them about GrandCon and gauge their interest in taking part. Personally I got a chance to play a couple games: Mage Wars and Cash’n Guns. I enjoyed both. One of the truly funniest interactions was with a vendor, who took a look at our vendor agreement and said that he felt we were charging too much for a 2-day convention. Now without getting into specifics, I’ll say that our table price is <$100, and for that you get your table with tablecloth, 2 chairs, 2 badges, power, wifi, 2 bottles of water, and we feed you 1 midday meal each day. (Hey vendors, is there any other convention out there that feeds you?!?) I’m no expert, but my pricing seems pretty fair to me. Oh well, you can’t please everybody. Overall I have nothing but compliments for the U-Con staff. The people were friendly and well-informed. They had a beautiful onsite program, a great space, and everything ran very smoothly. So that was Saturday, and Sunday it was on to Fanfare. Now I know this is a gaming site, and Detroit Fanfare is a comic book convention, so I’ll not dwell too long. Our ride over was overshadowed with just a tinge of nervousness since the I-96 shooter had not yet been caught. Fortunately, neither Brian nor I had to take a bullet in pursuit of our quest to get to Fanfare. Now I have long since know the difference in behavior between game con attendees and comic con attendees, but walking into Fanfare really hammered that home. Whereas game con attendees tend to vacillate between a Dealer Room where you walk around and a Gaming Room where you find a place to be and then stay there for a while, comic con attendees are all about moving around. People don’t sit down to enjoy their comic purchases in the same way they sit down to engage their new game. (This has been one of the unique challenges in planning a show that brings the two together.) Instead of a Dealer Room and a Gaming Room, Fanfare is all Dealer Room, and the energy and noise is just crazy. Table after table of industry professional engaging the fans, it was overwhelming…and it went on and on and on. Fanfare was very large, and something to which we can hopefully aspire for GrandCon and Grand Rapids. Brian and I made our rounds, but instead of a few minutes, it took us hours, and we still did not see everyone we had hoped to. But we made many good contacts and there was a lot of enthusiasm for a GrandCon. Everyone agreed that it was definitely time to make that happen, and I think a lot of folks were impressed with the plan that Brian and I have to bring it together. So overall: mission accomplished. Not only did we have a great time personally, but we made huge strides on behalf of GrandCon, and the concept was received with overwhelming support by everyone. As I’m typing this we are only 9 days from the New Year. Brian and I have been hard at work behind the scenes rallying support for GrandCon, and we have a HUGE announcement that we’ll make on New Year’s Day. To quote myself, this is going to take GrandCon from the “little con that could” to the next level. So very excited to make this public, but you’ll have to wait just a bit longer for my next entry. 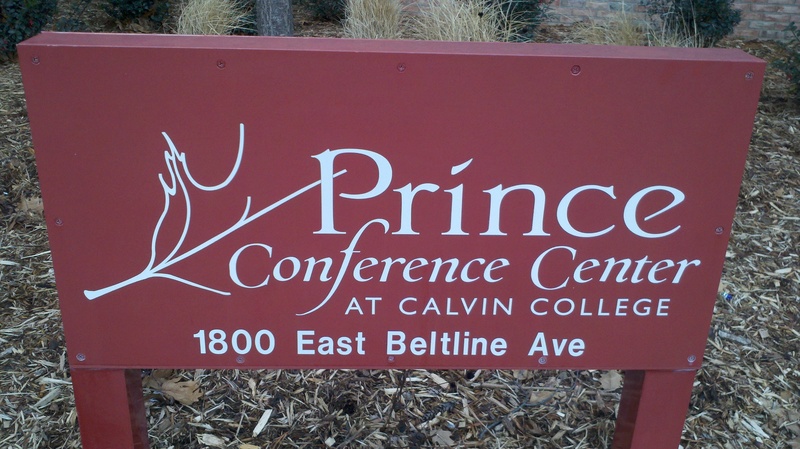 After that I want to take some time to highlight the incredible Prince Conference Center. I’ve been to a lot of conventions, and this place is top notch. Today on Dice Hate Me, we are lucky to have another guest review from the multi-tasking master, Marc Specter.This time, Marc takes a look at a storytelling game, currently on Kickstarter, that is great for families and gamers alike. Enjoy! A few weeks ago Robert Burke put out the call offering the opportunity to give his newest game Gnomes: The Great Sweeping of Ammowan (on Kickstarter now: http://www.kickstarter.com/projects/478379924/gnomes-the-great-sweeping-of-ammowan?ref=live), a try. Always eager to be an early adopter, I replied and said I would love to give it a go. By the next day I had received the file. And it sat. And it sat. So in addition to a review, this is my apology to you, Robert, that it too me so long to put this out there. Gnomes are tiny creatures who live in the Kingdom of Ammowan, aka our backyard (or your backyard, or local park, you get the idea). Every year the Great Sweeping takes place, where the trolls come through trying to capture the gnomes. Gnomes are typically very careful to clean up after themselves, especially at this time of year. But it seems this year a few young’uns forgot and left some things around. If the trolls find these items, the gig is up, and the gnomes are in trouble. And so with much debate and a council vote, the gnomes have contacted us, the Giant-folk, to help save their kingdom. 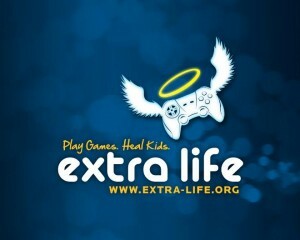 I love listening to gaming podcasts (especially the one that is allowing me to use his blog). I have about a dozen on my listening roster, and I was a fan of Cody & John before they retired their microphones. to have with our local independent bookseller, Schuler Books & Music (www.schulerbooks.com). Schuler had found out about us because one of their employees is a gamer, and they wanted an active group like the West Michigan Tabletop Gamers (http://www.meetup.com/West-Michigan-Tabletop-Gamers/) not only to be aware of their game inventory, but also to help make other gamers aware. So we were sitting in that meeting, hammering out the details of an allience, when I looked over at their great space and popped the question. 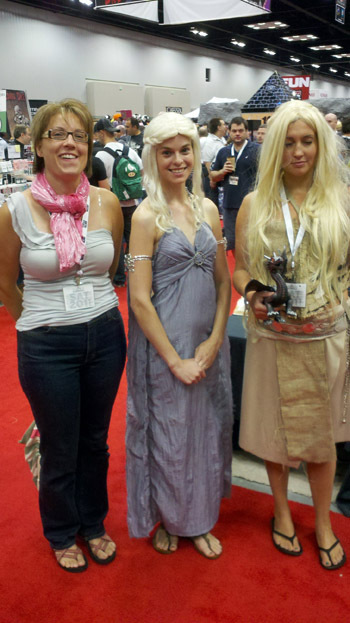 No…they wouldn’t marry me, but they WOULD host our overnight game-a-thon. (Or at least that was the conclusion they came to after a few weeks of decision-making.) 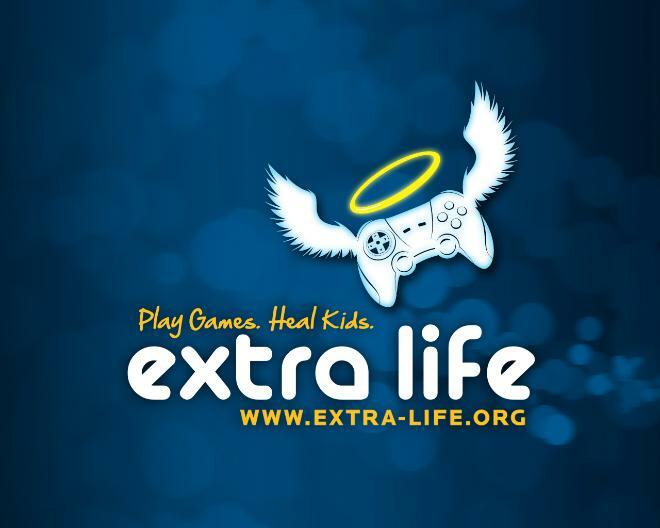 This would not only serve as a fantastic charitable event, but it could serve us as a sort of pre-convention, and put us in front of all of the gamers we were hoping to attract to our main event in less than a year. Today on Dice Hate Me, we are lucky to have another guest review from the multi-tasking master, Marc Specter. On the last State of Games podcast, we talked to Stephen Buonocore from Stronghold Games about his plethora of fall releases, and Little Devils was mentioned. Since we love trick-taking card games, we were definitely interested in knowing more. Thankfully, Marc read our minds and now provides a sneak peek for all you little devils out there who love card games as much as we do. Enjoy! I am not really a card gamer. There is nothing that sounds less interesting to me than a night with friends + a deck of cards. And I live in Michigan, home to that Midwest stalwart Euchre. I could just groan whenever a fellow Michigander whips out his deck and says, “I know this great trick-taking game!” So you can see why, given the nature of Little Devils, it was with significant reservation that I made my approach. BUT BOY WAS I WRONG! 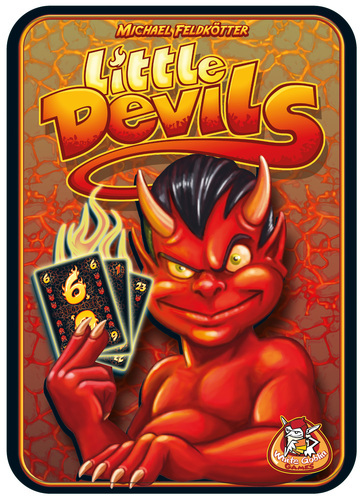 Little Devils has proved to me just how much fun a card game can be. In my last entry I mentioned how across my gaming career, it was only recently that I got involved locally with gamers who did not first begin as friends. Gaming with strangers, albeit gamer strangers, is another matter. Despite being in sales for the past 12 years, my desire and ability to interact with complete strangers is limited, and walking into a room full of strangers who have known each other forever is a bit out of my comfort zone. That is again perhaps why I founded 3rd Wednesday Gaming (3WG). Now, let’s be Wayne and Garth for a moment and take our wayback machine back even a few years further. 3WG actually began its life as Man Game Night. A group of buddies were invited at intervals that fit my schedule to meet at B&N and hang and game. We had a good but limited run. Life got busy, and after enough aborted attempts at Man Game Night, it petered off. was good, and they separated the thick paper from the thin paper. The Creators called the thick paper “boards,” and the thin paper they called “cards.” And there was turns and a round–the first play. And the Creators said, “Let there be a vault between the surfaces to separate floor from ceiling. So the Creators made the vault and separated the floor under the vault from the ceiling above it. And it was so. The Creators called the vault “tabletop.” And there was turns, and there were rounds–the second play. And the Creators said, “Let the paper under the ceiling be gathered to one place, and let dry ground appear.” And it was so. The Creators called the dry ground “the play area,” and the gathered pieces he called dice. And the Creators saw that it was good. In these days of the anti-hero, it is very easy to get caught up in the dark and gritty corners of Gotham and its lookalikes. If that is your bent, then I might advise to you take a step back from Clever Mojo Games’s new release: Sunrise City. And if you did, you might also be missing a humdinger of a new game from one of small game publishing’s powerhouses. In Sunrise City you take on the role—three, actually—of a stakeholder in the construction of the city of the same name. Through timing the use of your roles and clever tile placement, you and your fellow city officials will build Sunrise City from the ground up. While you and your opponents literally raise Sunrise City from its foundations, you will score Benchmark tokens. The player who ends with the most of these will be the winner.